QIDO. Qwerty to Dvorak USB Converter Adapter. Today, one Facebook Group I signed up to years ago, came alive again. The Dvorak – The Keyboard Layout Group After having no activity forever (at least in Internet time), I was surprised to have dozens of posts filter in within minutes of it being updated! There are THAT many Dvorak users? 900 apparently. The transition for me was quite painful at work! I worked for a large bank in Canada and each computer was set up identically and customizations of any kind were blocked. I had a really nice IT guy over from Vancouver to the branch one day, and he logged into my user configuration and set me up! He even gave me the registry key so I could add it in the future. The user profiles auto-refreshed about once a month, and the ‘hack’ was erased. The registry key got me up and running within minutes. When I left that bank, and moved to my current company, the registry key didn’t work. I had to get approved to use Dvorak by a senior executive that hadn’t heard of it, and I had to plead my case. Luckily for me I was approved, and have had it as my default keyboard since. But it got me nervous that at some point in the future, I may have to go back to Qwerty! Now there is a better solution out there! The QIDO USB converter adapter. 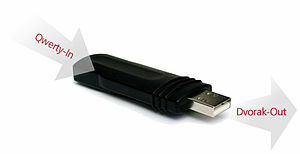 It is a hardware device that goes between the USB plugin from the keyboard and the computer. It converts the keys on the fly. What a great solution! The price is a bit steep for me ($89 USD), and right now with my company’s support, I won’t have to worry about coming up with my own customized solution. But if the time ever comes (like when they move to Windows 7, or the US dollar keeps collapsing), it might just be better to get them to buy me the QIDO than waste a bunch of IT and executive time approving me and maintaining my customized user profile. Here is a snippet from their site. Check it out! What is the QIDO – Qwerty to Dvorak USB Adapter? QIDO stands for ‘Qwerty-In Dvorak-Out’. The QIDO Qwerty to Dvorak USB Adapter is a tiny USB plug which attaches between an external USB keyboard and PC/Mac and lets users toggle between the conventional Qwerty layout and the more-efficient Dvorak layout. Its built-in layout switch mechanism is activated by a simple tap of the NumLock key (or Clear key on some Mac keyboard) twice in quick succession. With its quick switching mechanism and portability, QIDO also brings the commitment to learn and use the Dvorak layout as a viable option within the grasp of every computer user. The QIDO is small, portable and easy to use… the perfect answer for environments where both Dvorak and Qwerty typists need to co-exist, such as in the workplace, at school, or at home. via QIDO the Qwerty to Dvorak USB Converter Adapter. Qwerty in, Dvorak out. Powered by KeyGhost USB..
Have you ever used the QIDO USB Converter Adapter? Let me know if you have! I’d love to hear your experience with it. Next PostNext Fukushima, Hurricane Katrina, and the BP Oil Spill. Does anyone care?